How to watch MKV movies on Smart TV/LED TV/LCD TV via USB? If you have got a nice LED/LCD/Smart TV, you may have below problems. These questions is about how can watch MKV files on TV. Q 1: When i play 3D MKV movie on my quart TV via USB, i can’t play the sound. What is the problem? The movies are MKV files? Q2: Format in USB will play in Samsung series 6 LED TV? Can i watch MKV files on TV? My Smart TV can’t play MKV files USB while other files like that is ok? Q 3: I am trying to play .mkv files on TV via USB stick. Some play some don’t, and some play video only but no audio. Please help me. A: MKV is a container format, a kind of Matroska media files, Matroska is a new multimedia package format, also known as multi-media containers. It can be a variety of encoded video and more than 16 different formats of audio and subtitle streams in different languages package them into a Matroska Media files. Smart TV/LED TV/LCD TV can’t play all MKV format. If your TV can’t read MKV files, you need MKV to TV Converter to convert MKV files to TV supported video format. H.264 video AC3 Audio MP4 is your best choice. You can free download MKV to TV Converter (MKV to Smart TV Converter/MKV to LED TV Converter/MKV to LCD TV Converter) or MKV to TV Converter for Mac. Guide: How to watch MKV movies on Smart TV/LED TV/LCD TV via USB? 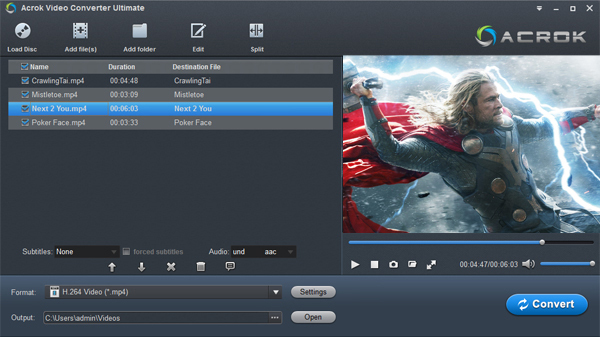 Step 1: Run TV MKV Converter, add MKV file into this software. Click “Output Format”, choose H.264 MP4 as output video format. If you want to get 1080P video source, you can choose HD MP4 format. This HD MP4 format can help you watch 10080p movies on Smart TV/LED TV/LCD TV. How to get 3D movies for Smart TV/LED TV/LCD TV? You can click “Settings” icon then go into 3D window. You can choose 3D effect as you like. Click “Settings”, you need set the video and audio parameter as below. When the settings done, click “Ok” button. Click “Convert” button to start MKV to Smart TV/LED TV/LCD TV MP4 conversion on Widows or Mac. After conversion, click “Open Folder” to get the converted 2D 1080p/3D 1080p MP4 movies. Copy them to your USB. Insert the USB to TV USB interface, now, you can watch MKV movies on all TVs. I use Blu-ray Ripper to convert purchased Blu-ray’s to various formats for use on my smartphone and tablet. I have tried many but nothing compares. Professional video converter yet easy-to-use! Acrok Video Converter Ultimate helps to convert all kinds of video and audio formats with almost no loss of quality. 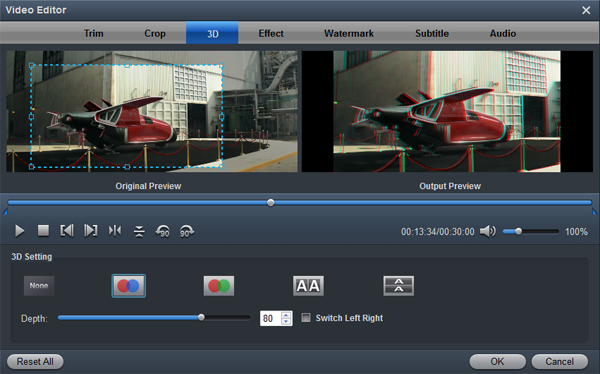 Also features video downloading or editing functions.